Damaged or non functioning parts can be fixed or changed after sending back the receipt of purchase and the flash drive in one part. Please note that warranty is valid only in case of proper use. 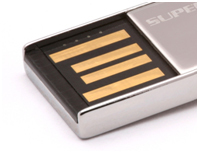 What is the proper use of your USB flash drive to avoid guarantee loss? Plugging your flash drive into the USB port make sure you hold it in the right direction. This is the way how USB ports should be assembled into the computer. Be aware it might be upside down too! So if the USB port looks like this one below on the first picture, the 4 metal chips should face upwards before plugging the flash drive in. Don’t plug your flash drive upside down, it can damage the computer too! 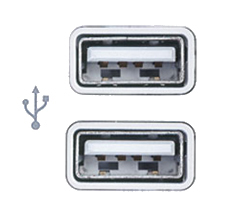 In the rare case of the USB port is turned with 180 degree, face the 4 metal strips downwards before plugging in! What is the normal working environment for flash drives? A USB flash drive is for fast data transfer and storage. It is NOT SUITABLE for 24-48 hour-operation without any interruption. If it is out of use unplug it! Don’t use it when the surrounding moisture is high or when the the temperature is extremely high or low! The ideal operating temperature is in between +5 and +40 Celsius degree. *The 3D printed body is not under guarantee.